Anti-whaling group Sea Shepherd has slammed Japan's whaling research program as ships without harpoons prepare to head for Antarctic waters. Activists called the program “farcical,” citing Tokyo’s plan to resume killing whales in the region this year. Japanese researchers will be heading this week to the Antarctic in the framework of the annual whaling campaign in the region, according to Japan's Institute of Cetacean Research. However, this time the ships will not be equipped with harpoons due to the International Court of Justice (ICJ) ban imposed on the Antarctic hunt in March. The court ruling said that Japan’s Southern Ocean efforts are illegal, as they carry out commercial hunting practices under the veneer of research. Three ships will be conducting non-lethal research on whales, such as sighting surveys and biopsy sampling until the end of March. 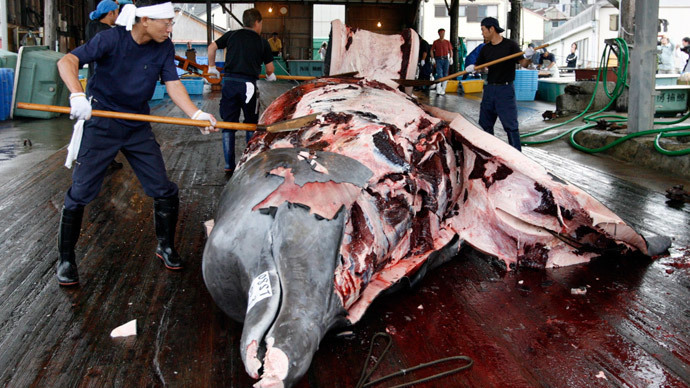 However, Tokyo said that it is poised to resume “research” whaling hunting by the end of 2015. In September, Japan submitted a new plan to the International Whaling Commission (IWC) and its Scientific Committee, which set an annual target of 333 minke whales for future hunts instead of 900. The anti-whaling group Sea Shepherd slammed the current Japanese campaign on Tuesday, saying that Tokyo is collecting data with a goal to kill more whales in the future. “The government of Japan's farcical, non-lethal whaling initiative must be seen in the context of a greater criminal conspiracy," Captain Peter Hammarstedt from Sea Shepherd said in a statement. "Japan's non-lethal program is the equivalent of robbers casing a bank in preparation for a robbery; the heist that robs the world of its most majestic creatures." The Japanese fleet departs twice a year for whaling campaigns to the Southern Ocean and the Pacific. The latter is not as widely known internationally and was not specifically mentioned in the March ruling. During the North Pacific campaigns, whalers can kill up to 200 minke whales, 50 Brydes, 100 sei whales, and 10 sperm whales, according to the International Fund for Animal Welfare. The whaling campaigns are officially aimed at researching the contents of whales' stomachs to survey the impact of their predation on coastal fishing, the Japan Times reported. The meat of the mammals is usually sold in markets and restaurants. Activists, particularly those from Australia and New Zealand, have repeatedly stressed the need to protect the endangered species. In addition, a recent study conducted by US scientists from the University of Vermont revealed that whales are capable of supporting the ocean ecosystem.